Descending tracts of spinal cord pass down through lateral and anterior white columns of spinal cord. Descending tracts are axons of neurons of various supraspinal centers which include motor centers in cerebral cortex and brainstem. The neurons of supraspinal centers are known as upper motor neurons which finally project on motor neurons of anterior horn cells of spinal cord called lower motor neurons. Descending tract is a part of motor pathway which is usually made up of three order of neurons. The first order neurons are neurons of supraspinal centers. Second order neurons are internuncial neurons situated in anterior gray column of spinal cord. Third order neurons are alpha and gamma motor neurons of spinal cord. Axons of these neurons reach the effector organs (voluntary muscles) via the anterior root of spinal nerve which is known as final common pathway of Sherrington. Descending tract discharges constantly impulse on lower motor neuron to exert following functions. It controls movements, muscle tone and posture. It modulates spinal reflex mechanism. It also modulates transmission of afferent information to higher centers. It exerts influence on visceral activities through its control on spinal autonomic motor neurons. Corticobulbar (corticonuclear) tracts: Projecting to motor nuclei of cranial nerves situated in brainstem, which do not extend low down upto spinal cord. From different subcortical centers to the spinal cord: Noncorticospinal tracts. Postcentral gyrus (area 3, 1, 2) and adjacent parietal cortex (area 5) = 40%. Initially corticospinal and corticobulbar (corticonuclear) tract fibers run down in association with each other through subcortical white matter to the level of brainstem where corticobulbar (corticonuclear) fibers terminate in contralateral motor nuclei of different cranial nerves. 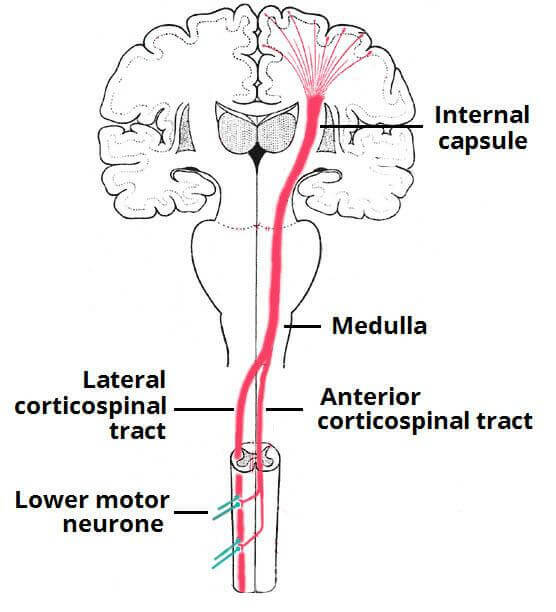 Corticospinal tract fibers descend alone further through the spinal cord. While passing through the medulla oblongata to approach spinal cord, fibers of corticospinal tract arising from pyramidal cells of cerebral cortex passes beneath the paramedian ventral bulge looking like a pyramid with its narrower end directed downwards. That is why corticospinal tract is called pyramidal tract. Number of fibers: Pyramidal tract of each side contains 1 million fibers. Fibers mostly myelinated: 70% fibers are myelinated. 1% = 11 – 22 mm, which are the axons of giant pyramidal cells of Betz situated in primary motor cortex.